The perfect gift for the gamer in your life (or their parents!) | you found me. 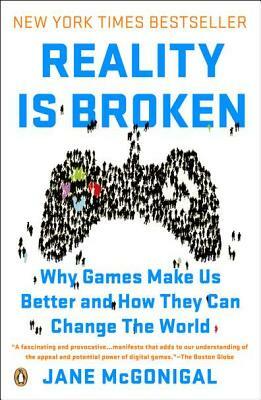 I’d love to sign and personalize a paperback copy of the New York Times bestseller Reality is Broken: Why Games Make Us Better and How They Can Change the World, and write a special message inside to anyone you want. I’ll customize the message — tell me their favorite game, or their aspirations (are they studying to be a game designer or hope to be one? are they working on a game for change right now? ), or a tongue-in-cheek message (one I’m often asked to write: “Your mom finally admits that you were right! Keep gaming!”) Just be sure to tell me their name, and if they’re a gamer, a game designer (or aspiring), a parent of a gamer, a teacher, anything that will make it more personal. SEND THE BOOK AND DVD! $40 The book (signed, personalized) + bonus limited edition pin! $50 The book + DVD (signed, personalized) + bonus limited edition pin!